Hey friends! A REVIEW! FINALLY! :P Let's get back into the swing of things with some Seche products from a polish shop called Live Love Polish. They sent me one of Seche's Nail Lacquers to review. I was super excited to play with it. I've never tried their colors, just their top coat. If this tickles your fancy, check out my review after the jump! 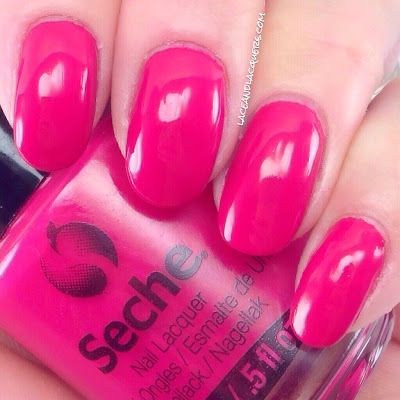 Seche Audacious is a bright fuchsia creme. This is one of those colors that is a staple to anyone's polish collection. While not unique, it's a nice color to throw on! I was quite impressed with this polish, I might have to look into purchasing more. I had never tried Seche's nail lacquers, but I was quite impressed. I did 2 coats of Audacious, but if I did my coats a little thicker I could of got away with 1 coat! The application was super smooth and easy to work with. It was nice and opaque with awesome color. It dried nice and quick without the use of a top coat. I'd say in 30 sec. to a minute, it was dry to the touch. For these swatches I applied Seche Vite Fast Dry Fast Top Coat, nothin' makes a mani shinier! My only complaint is that when I top coated it, some of the color came off on the top coat brush. I just wiped it off on a piece of paper before re-dipping the brush. I know some people are concerned about the ingredients in Seche Vite's top coat. 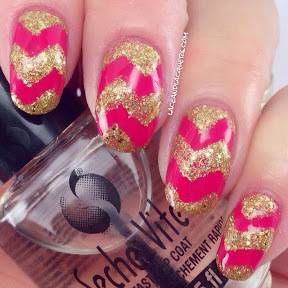 If you've heard of Seche Vite, I'm sure you've heard people's concerns. Maybe I live on the edge, but I honestly don't care LMFAO! I don't use it in a super closed in area either. I digress! I tried to peel the little sticker with the arrow to read the ingredients... for 10 minutes... So I Googled it instead. According to The PolishAholic: unlike the top coat, their nail lacquers are 3-Free (formaldehyde, toluene and dibutyl phthalate (DBP))! I was happy they provided me a new bottle of Seche Vite to use for this review! This is my go-to top coat. It's the quickest drying top coat I've ever used. I hardly use anything else. I know not everyone has the best time with or loves Seche Vite, but I can't get enough of it. Even if I do try another top coat, I always come back to Seche Vite. I've been refilling/restoring my 3 rotating bottles for about a year now... but NOTHING beats a fresh bottle of Seche Vite Top Coat. Brands Carried: China Glaze, Color Club, Floss Bloss, LVX, Models Own, Mint Polish, NCLA, Pretty & Polished, RGB, Seche, Tenoverten, UNT. Shipping: Worldwide. 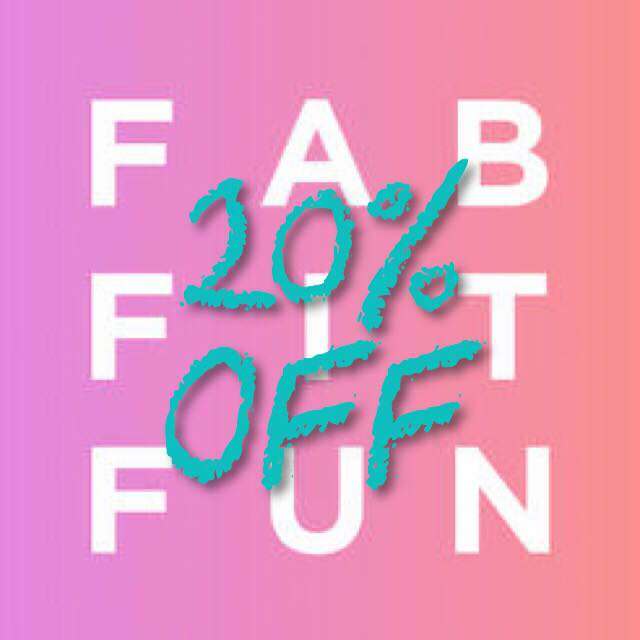 Free US shipping at $20+. 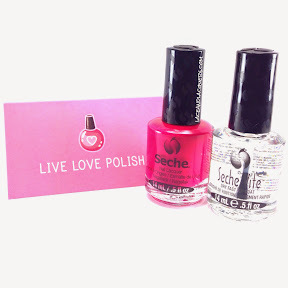 So there ya go, the Seche polishes I received from Live Love Polish! Be sure to check them out in the links above. Great shop to bookmark while searching for a polish to buy :] They ship worldwide and provide free shipping in the US with orders of $20+! These items were sent for review. My opinions of the brand are my own and are not influenced in any way. Please read the disclaimer tab for more information about my reviews. © Lace &/and Lacquers - Lacey Stinson 2011-current. Powered by Blogger.